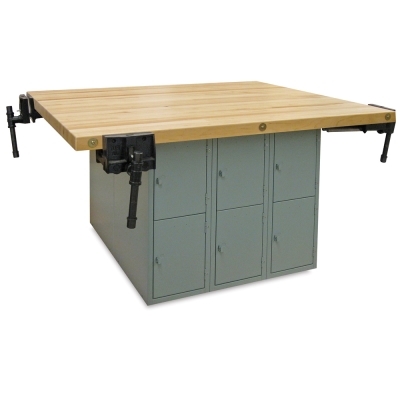 There's plenty of room for storage in these versatile workbenches, each with its two gray steel base units placed back to back. Maple top is 64"W × 54"D. Sturdy locker doors are equipped with spring hinges. Two base units each contain six vertical openings measuring 15"H × 12"W × 21"D. The locker doors include a padlock hasp and knockout for a cylinder lock. Shipping weight is 532 lbs (241 kg).